Evolutionary Versus Revolutionary: Small Changes or Something New. To give you a real-world example, let’s take an example from the PC world. Microsoft vs. Apple. Microsoft is one of the most evolutionary companies on the planet. They usually start with an idea someone else has come up with and modify it slightly. They put their marketing muscle behind it and make incremental changes over time. Take Microsoft Word for example. It has incrementally changed since the mid 90’s. Each new update brings a new feature or two, but Word 365 is fundamentally the same as Word 97. Sure it has a new ribbon toolbar, but it works in almost the exact same way as it’s predecessor. It has basically become a commodity. And commodities soon go to the lowest bidder. Apple, on the other hand, has come out with many revolutionary products. Walk into one of their stores and be wowed with innovation. Starting with the Macintosh back in the 80’s almost every product has set new ground. There was the iPod, the iPhone, and now the iPad. Each one selling out with store lines around the block. Revolution done right can have incredible results. When setting goals for the future, you can take either approach. Will you be like the mainstream crowd, take the status quo, and go for small improvements or will you take a revolutionary idea and run with it. I would argue for Apple’s approach. Do something revolutionary and then make evolutionary changes. 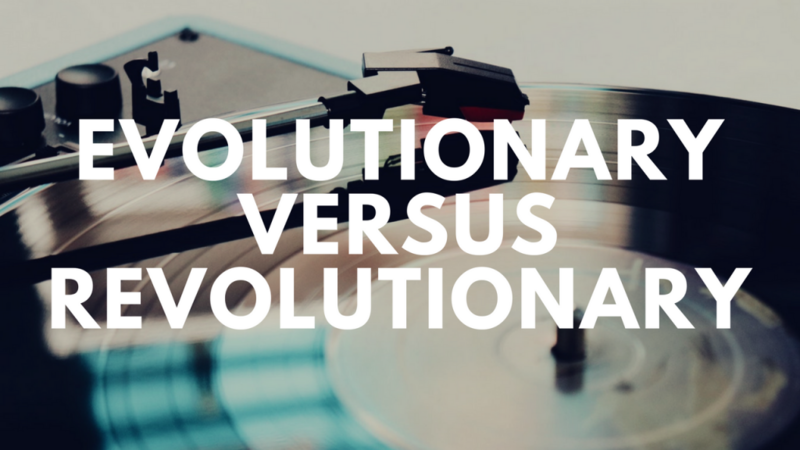 Evolutionary versus revolutionary, that is a question most businesses need to ask. Do you play it safe a make a micro change for the new year? Maybe a tweak here or a slight change there. Or do you go big? Scrap the old and come out with something that no one has seen before. Do you burn the ships and go for it, or resort to that incremental change? Question: What revolution do you want to start?